Ever since I got hold of a friend's hot pink shades, its been hard to part with it (besides its mine now). 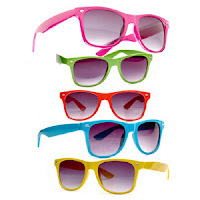 Colorful shades are fun, free, lively and cool...and as far as I am concerned they suit all ages when worn right of course. You can pair them up with pretty much anything. It really doesn't matter whether you coordinate your outfit...matching isn't necessarily the way to go. If you do match then it also serves as the perfect accessory. Colorful shades are amazing casual-urban-wear complements. Picture you on a sunny day in a sheer tee, either plain or graphic, paired with a pair of black jeans with mustard sandals...and ofcourse your mustard shades on. Don't you look divine? I think you do too. Finally you don't have to spend a whole lot of money to get one of these....the pair I rock (and rock well) go for about $5....and I feel like a million bucks in them :).